Writing a good personal statement for college is a tricky task. There are endless ways to write a good essay, as well as endless ideas to draw upon from your own individual life. The smallest experience can be the perfect example of a stand-out quality you want to highlight, and sometimes it is difficult to pinpoint these good experiences to write about. A good personal statement for college is one that is unique, well-written, and demonstrates who you are. The key word here is personal. But while most of your experiences, honors, and activities are fair game to that end, there are certain topics which are either overly used, poorly executed, poorly received, or a combination of all three. The following list outlines topics to avoid in your personal statement for college. 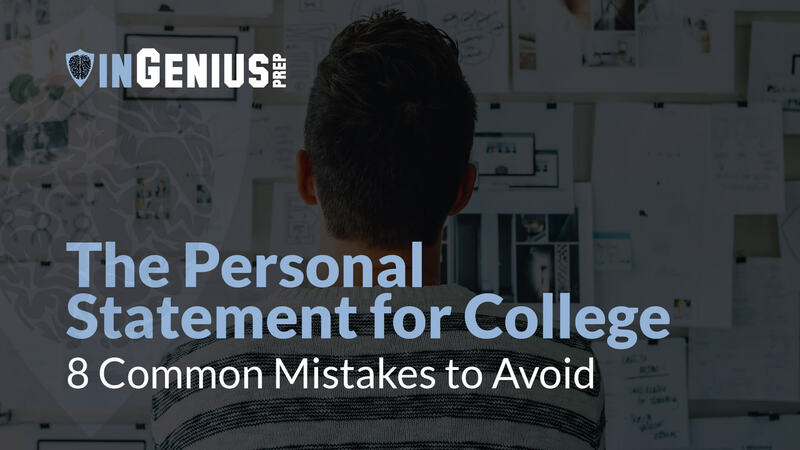 Perhaps the most common mistake that college applicants make is to re-write their resumé or activities list and call it a personal statement. This is bad for several reasons. First, it gives admissions officers no information about you that they didn’t already have. In general, the less they know about you, the less likely you are to be admitted. Second, rewriting your resumé makes you seem uncreative. If you are incapable of writing a 2-3 page paper that doesn’t repeat the other 12 pages you’ve sent the admissions office, then you seem uncreative, or, worse, lazy. This does not mean that you cannot discuss activities or experiences which also appear on your application; indeed, you almost always should discuss activities and experiences which appear elsewhere. Your personal statement for college is a great time to reinforce and highlight your unique interests and views. However, those activities which you discuss must be related to the broader theme of your personal statement. They should not be a simple recitation of your most impressive awards, honors, etc. A classic mistake is for college applicants to “invent” adversity in their lives. This often takes the form of re-imagining a small set-back as being equivalent to a life of hardship and tribulation. Students might write about having difficulty in a class, failing a test, or being unpopular in middle school, as evidence that they too have overcome adversity. While it is certainly true that everyone experiences hardship differently, you must understand that from a third party perspective, these sorts of problems do not register as true adversity. Thus, if you are going to discuss how you overcame adversity in your personal statement for college, be sure that you are discussing a matter with which anyone could sympathize. On the other hand, if you had to work the night shifts of a part-time job to save up for college, you can feel fairly confident that most admissions officers will not question the challenges you’ve faced. In short, if you have to ask yourself, “Is this really adversity?” the answer is almost certainly no. Remember that you will be applying against individuals who have endured unquestionable adversity: people who have endured war, crippling disease, traumatic violence. That is the standard by which you should assess your struggles. If you lack genuine racial, ethnic, or national diversity, do not depict yourself otherwise in your personal statement. Many applicants try to trump up their distant and attenuated lineage, in the hopes of getting “diversity points” for their application. This is almost always a bad idea. Admissions officers are easily able to spot this sort of ploy for the “diversity points.” So, if your diversity isn’t related to succeeding in college, then it doesn’t belong in your personal statement. That being said, colleges do look for people with varied backgrounds and perspectives - i.e. diversity - so if you come from a unique background, then you should of course highlight this in your personal statement for college or elsewhere on your application. This is one of the essay topics that appears so frequently in the average personal statement for college that they make every admissions officer’s eyes roll. Most students applying to college participate in athletics at some point throughout their high school careers. Many get injured. Unless you were the top Division I field hockey recruit in the country, steer clear of this topic (and even if you were, this topic is still clichéd). The “injured athlete” story is usually similar to the “overcoming adversity” motif. So, to reiterate, you need to make sure that the adversity you face is objectively true. “I learned so much about Mexican culture during my extended stay in Cabo San Lucas.” It is worth noting that tons of students write about the time they spent traveling. For the most part, admissions officers can easily determine when these trips were glorified vacations and when they were meaningful academic, intellectual, or philosophical experiences. It is tempting to write about global connections and experiences in your personal statement for college, but unless your experience abroad was highly standout and unique, this topic is best to avoid because it is overdone. Most of us can relate to being inspired by someone close to us. Our family members have gone through great lengths to help us get to where we are are today. But recounting the great feats that your grandmother met to arrive successfully at the present moment is a bad idea. An admissions officer in most cases would commend your inspiring relative. But they are not evaluating your grandmother’s application. They want to find out about you. Your personal statement for college needs to be, first and foremost, personal. You should be the main character in your essay. Always. If you write about your middle school achievements, admissions officers will think you have accomplished nothing of value in high school. Unless your achievements were truly outstanding (for example, you started a successful company that is still in place today), or if the topic you write about is ongoing and still relevant, you should avoid writing about middle school. It is a personal statement for college - make it personal, and make it relevant to college. You have 650 words on your personal statement for college, which in the grand scheme of things, is not very many. There is certainly not enough space to highlight everything you have ever done or achieved. Instead, you should focus on choosing a specific time or experience or topic that can stand as an example of your interests and background more generally. In trying to accomplish too much, you will in turn, accomplish very little. Every part of the application is important. Your GPA and standardized test scores qualify you for certain schools. But sometimes you don’t have the highest SAT score. You can still get into top schools by using your personal statement for college as a chance to set yourself apart. Draw from experiences that are unique, that are personal, and that clearly display your individual interests.